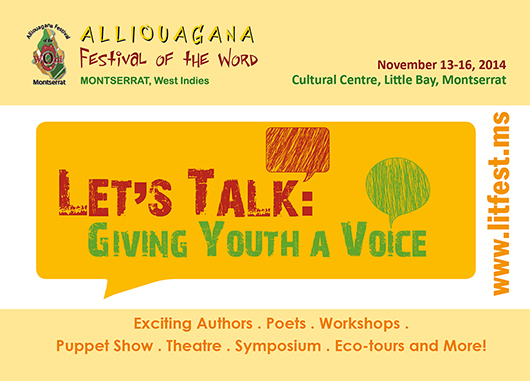 The sixth annual Alliouagana Festival of the Word (AFW) will take place from November 13-16, 2014, at the Montserrat Cultural Centre. This year’s theme is Let’s Talk: Giving Youth a Voice, allowing for a focus on books for young people, how to write for a younger audience, the cultural importance for Montserrat of the spoken word in storytelling, poetry and drama, and the need to let youth voice their joys and share their concerns and fears about their present and future lives. This year AFW welcomes the support of the Canadian Organization for Development through Education (CODE) and specifically its Burt Award for Caribbean Literature for Young Adults to bring this year’s first prize winner of the Burt Award to Montserrat – A-dZiko Simba Gegele from Jamaica. She will talk about her award winning book All Over Again and has agreed to do a special workshop with youngsters. While it was anticipated that there would be a welcome home production of Lady of Parham by David Edgecombe, this has been postponed until further notice. In its place however, will be Dorbrene O’Marde’s This World Spin One Way, a play that explores the complex relationships between men and women. Our partners, the Coral Cay Group will be doing a workshop explaining the important role youth can play in protecting Montserrat’ s natural resources; and the group will also mount one of their popular puppet shows. The AFW will also feature School Visits by guest authors, Book Launches, a Book Lovers’ Parade, Open Mic session, prize giving ceremony for the MVO Creative Writing Competition and more. The first night of the festival, November 13, is a Symposium in The Alphonso “Arrow” Cassell Memorial Lecture Series. The topic for this year’s Symposium is Arts and the Environment: Implications for the Creative and Cultural Industries in the Caribbean. Keynote speaker, Professor Ian Boxill from the University of the West Indies, Mona Campus will be joined by five other speakers to address an interesting range of aspects of the topic. Also to be launched on the first night of the festival is an exhibition entitled Artists Enriching Our Community: Enriching our World celebrating the work of two ladies (Maggie Peters, 1917 – 2006 and Demetre Pollock, 1915 – 2011) who made Montserrat their home and had a significant impact on art and craft entrepreneurial activities. A warm welcome is extended to young and old from near and far to attend what promise to be stimulating and educational events at this year’s AFW.